2. Pour the butter through a fine sieve to remove the mint pieces. Use a wooden spoon or rubber spatula to push on the mint and extract any juices back into the butter. 3. In the bowl of a stand mixer fitted with a paddle attachment, cream together the butter and dark brown sugar. Mix in the vanilla and egg. Scrape down the bowl. 4. In a large bowl, whisk together the salt, baking soda, baking powder, and flour. With the mixer on low, gradually add in the dry ingredients just until combined. Scrape down the bowl as needed. 5. 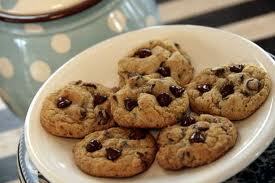 Fold in 6 oz of the chocolate chips, save the rest for topping the dough balls. 6. Cover and refrigerate the dough for at least 1 hour and preferably up to 24 hours. 7. Preheat oven to 375ºF. 8. Scoop large mounds of dough (about ¼ cup each) onto baking sheets. Put no more than 6 cookies per sheet. Top each mound of dough with several chocolate chips and sprinkle with a bit of kosher salt. 9. Bake at 375ºF for 10-12 minutes, just until the edges are set and the middle still looks doughy. Allow to cool on the cookie sheets for at least 10 minutes before removing.